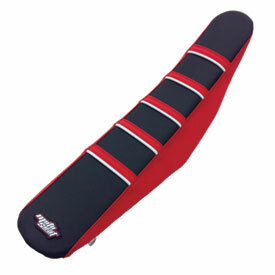 Ribbed accent traction seat cover. Installs easy. Almost too much grip, but I’m getting used to it. Looks really good. I think after some more time, I will really like it. Nothing not to like. Perfect fit in every way. Had it professionally installed. A little sticky but it needs to be in rough terrain. You won't be disappointed. Some may be annoyed by sitting on the ribs - I don't notice them, except when they keep me from sliding around. It did exactly what I need it to. Way better than stock. Grip is great!!! Not for sure about durability, only had one chance to ride since installing. Easy to install. Although, it did require a little stretch. 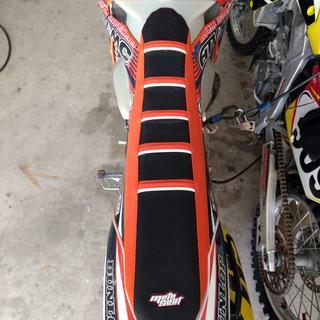 I absolutely love this seat cover it makes my bike look better and my knees don't slip off of it. It makes long hill climbs significantly easier because no matter what position your in your staying put. It also was a breeze to install. Worth it and isn't uncomfortable. Great cover. Offers superb traction without being uncomfortable. First time I rode on it, it about ripped my pants off. Quick cinch of the pants belt and good to go. You really don't notice the ribs when riding which is great. Used for about 5 rides so far and looks like it'll last a long time. 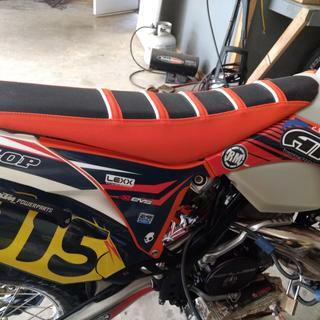 Provides way more grip than the stock seat cover on my 350 exc-f, and it looks nice as well. I took it to an auto upholsterer for the install and it looks factory, would highly recommend doing the same. Perfect fit, no wrinkles. Perfect color to match the bike. Perfect grip to help in corners without interfering with moving around while standing up. Perfect looks. Simple perfect in every way. 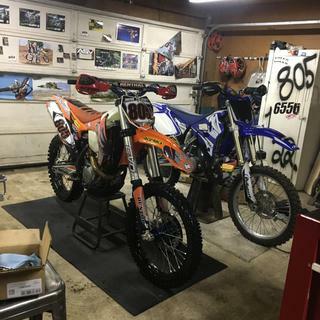 Will this fit a 2016 yz250x? 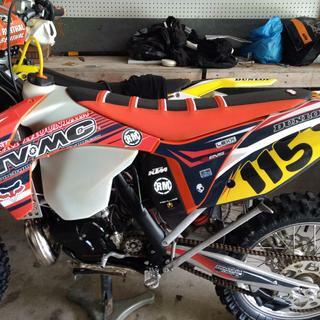 Or what seat cover do you offer for that bike? Thanks. BEST ANSWER: This one will not fit your machine. However, if you go to this link and then enter in your machine it will show you all of the seat covers we do have for this bike. 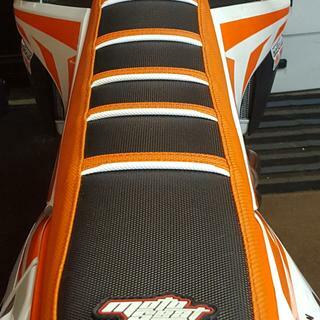 Do you have the Motoseat Beta seat cover for a 17 300rr? The one with red sides/blue top. BEST ANSWER: I checked our inventory and unfortunately we do not carry this seat cover for your machine.